What does a funeral director do when funerals are in short supply? A more pertinent question could not be asked at the moment, given the year-on-year downturn in the number of deaths in the UK. But before FSJ readers swamp the editor with suggestions, the Village Idiots have the answer – as revealed in Coffin Up at this year’s Edinburgh Fringe Festival, a production set to tour the UK in 2012. The local undertaker in Langsley Abbot – the ‘UK’s healthiest village’ – is experiencing a downturn in business. Bills keep arriving followed by visits from the bailiff. The answer is simple; bump off a few people to generate revenue. To the accompaniment of great music, the three mute and masked performers take on a variety of roles as the fortunes of the business are revitalised. It’s a fast-paced, light-hearted and thoroughly entertaining romp. Imaginative scenery, the versatile use of props and the excellent masks all add to the hilarity of this black comedy. 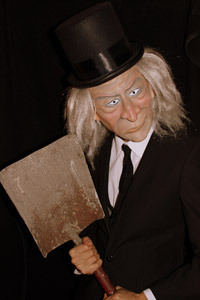 Some funeral directors will probably grimace at the stereotypical characterisation portrayed by Coffin Up: the elderly, lanky undertaker with wispy white hair and pale complexion who catnaps in an empty coffin while thinking of profits and holidays. It may be mockery, but there has never been a time when the occupation has not been ridiculed whether in the musical hall, on the screen or on TV. It just lends itself to humour. But does it really matter? This is theatre and great entertainment.